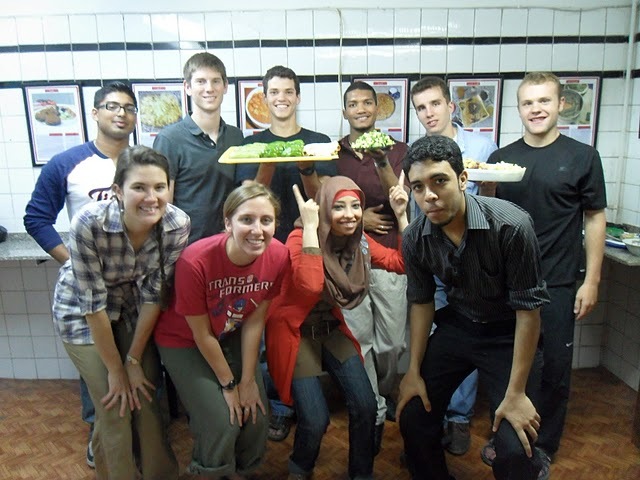 Learning Arab cooking proved a great way to learn about the local Food and culture. 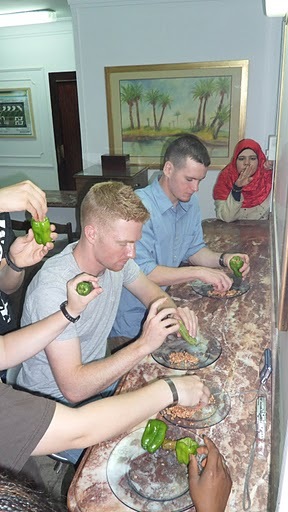 The ingredients were fresh, the smell is great and the students at AA seemed to enjoy the tasty activity of making Dolma. Going beyond the delicious smell, and the bright colors, Dolma or Mahshi, as it is called in the colloquial Egyptian Arabic, has quite a history to be proud of. This dish of stuffed vegetables goes back all the way to the Ottoman Empire and is popular in countries such as Turkey, Greece, Cyprus, the Balkans, Middle Eastern countries and Iran. 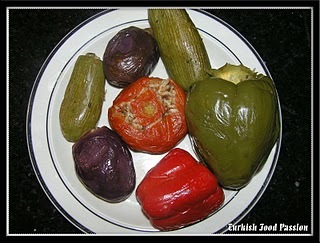 These stuffed vegetables include zucchini, eggplant, tomato, pepper and vine leaves. What many foreigners don’t know about making such dish is that it’s usually a communal activity. Often Baladi (or local) women who intend to do Mahshi; gather together around a table with a huge pot of rice stuffing and another one of vegetables and start emptying and stuffing the vegetable or rolling and stuffing in the vine leaves. Because it’s a time consuming activity, Mahshi is often made while chatting. My favorite thing about this dish is that it could be purely vegetarian, although some include minced meat in the stuffing. If it includes meat, then the Mahshi is served warm with a tomato sauce, if not then it is usually served at room temperature. Both are frequently eaten with yoghurt. Here’s the Mahshi recipe below. It is highly recommended to try. Arab Academy smelled absolutely delicious for the whole day! Preparation: Wash zucchini well. Remove stems using a knife. Hollow out using an apple corer. Wash zucchini inside and out. Drain. Filling: Mix minced meat with rice. Stir in salt and spices. Stuff zucchini, shake each after filling it so that the filling is well distributed (don’t over stuff). Arrange in a pot. Invert a plate on top. Strain tomatoes using a colander. Add 2 cups of water, shortening, and a dash of salt. Place tomato juice in a pot over medium heat. When it boils, add to zucchini. Cook for 1 hour, or until tender. Add crushed garlic and lemon juice. Cook for 5 minutes. Serve zucchini and sauce hot separately or together in a large bowl.